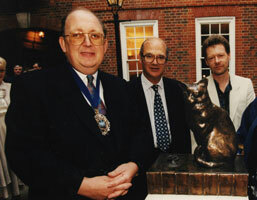 The sculptor Jon Bickley (at right) with the Lord Mayor of London (left) and Lord Harmsworth at the 1997 installation of Hodge outside Johnsons house. He did not suffer fools gladly, but Samuel Johnson, the formidable writer of the immortalDictionary of the English Language of 1755, was a fool for his beloved cat Hodge. He was even known to feed his feline friend oysters, which Johnson himself and not his house staff would fetch from the local market. Both cat and oyster have been preserved for posterity by Jon Bickley, an award-winning English sculptor and a lover of cats, dogs, elephants and just about every other four-footed creature. served as the model for Hodge. "a very fine cat indeed." An Honours graduate of the Norwich (England) School of Art and Design, Jon worked as a zookeeper before becoming a full-time sculptor 17 years ago. Not surprising, then, that his studio (a sixteenth-century barn) is often filled with animals in various states of bronze casting. Many eventually find their way to art galleries and private gardens around London, throughout Britain and in Europe. The Hodge Bookends that Levenger commissioned are a replica of the version of Hodge that Jon sculpted for Johnsons house in Gough Square, off Fleet Street in London. Visitors find Hodge sitting patiently atop a bronze version of the Dictionary. and feature one of Hodges much-loved oysters. oyster for his Hodge. It had to be a proper English oyster, though, and you cant buy them in the shops anymore, Jon says. So he made a special trip to the beach to find his quarry. The Lord Mayor of London was among the titled gentry on hand for Hodges installation in Gough Square. Unveiled in 1997, the bronze met the City of Londons goal of having a statue that visitors could connect with and would be drawn to. "I made Hodge about shoulder height for the average adult, Jon explains, which is just about right for putting an arm around." This is one cat that never minds a good stroking.